Thank you so much for your support, emails and comments on The Daily Connoisseur. With the birth of my baby girl, this past year has been the best of my life and I have been delighted to share it with you on this blog along with all of my memories from living in Paris, and my ongoing queries on how to live well. 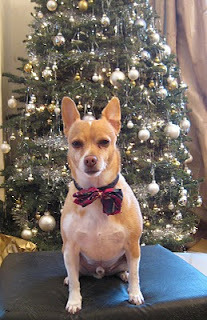 I will be taking a two week break from blogging, with posts resuming on January 3rd. And, as always, I love taking requests, so if there is a topic you would like me to address in my blog, please don’t hesitate to email me or leave me a comment. I do hope you’ll stay with me in the new year and until then, I am wishing you and your family the absolute best for 2011. Gatsby, quite in the holiday spirit, is pictured above. French women are not only known for taking great care of their skin, but also for being comfortable in their skin (or bien dans sa peau). Skin care is the most important aspect of French beauty. Good skin is like a status symbol and thanks to the copious options available in France (be it facials, specialty creams or massages) most anyone can achieve it. Good skin is not only a luxury in Paris but a necessity. Madame Chic had it. So did Madame Bohemienne. But French skincare goes way beyond a pot of expensive face cream. French women drink lots of water (a tall glass in the morning and one right before bed, plus several throughout the day), take brisk walks every day (good for circulation), try not to stress out too much (it’s hard to be passionate and stressed at the same time… the French much prefer to be passionate), and they don’t wear too much pore clogging makeup (see le no makeup look) Also, a healthy love life doesn’t hurt either! After having my baby my skin went through a few unfortunate transitions- and I can personally attest that having bad skin is one of the worst blows to self confidence a person can have. I can definitely see why a French woman views good skin as her best accessory. I’ve had to rethink my skincare routine and change a few things but I have finally gotten my skin back on track. Much like when I have indulged in too many fattening foods, I adjust my exercise regime, I did the same with my skincare routine. I was dealing primarily with breakouts (so unfortunate)- so I booked a facial as soon as I could. At home, I followed up by doing my normally once weekly mask 2 or 3 times a week (I use Epicuren’s Volcanic Clay Mask- LOVE), made sure I exfoliated and moisturized well and even changed my daytime face cream (Philosophy Hope in a Jar Oil Free SPF 30- I switched to ‘oil-free’ to accommodate my situation). And I booked a few reflexology massages to deal with my stress. It took some time but my skin is finally back on track… and with it, my confidence. Consult professionals regularly: dermatologists, and estheticians (for facials or any other treatments you might get). It is worth the expense, your skin will look beautiful for much longer. It is also quite handy to have a professional recommendation for the types of products your skin needs. You will save money in the long run by not experimenting with products that aren't right for your skin. Never underestimate the power of massage. Regular massage works wonders for the skin. It gets the toxins out and helps to keep stress levels down-vital for radiant skin. Invest in the best products you can afford. The French spend about $2.2 billion a year on skin care. Here they do not skimp- they will buy the best creams, serums and cleansers they can afford. And while I tend to agree that you get what you pay for with regards to skincare products, you can also find affordable drugstore alternatives as well. And while this tip isn’t particularly French… Acquaint yourself with the Clarisonic. My favorite skincare tool… ever. It is amazing, and yes, worth the investment. And most importantly… smile, emote, and really live (passionately) in your skin. Be comfortable and confident with who you are. Ignore the haters (if you have any- most people do). And just take comfort in being yourself. Nothing could be more attractive. Won’t you stay tuned for #5? The above picture is of a group of students in the Jardin du Luxembourg on the first hot Spring day in Paris. 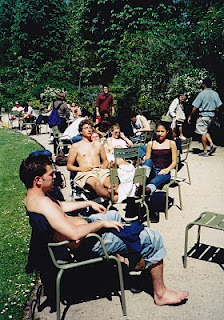 Normally accustomed to year round warm California weather, these students stopped everything they were doing and immediately went to sunbathe with the rest of the Parisians amongst the flora and fauna... Can you spot me? When the guidance councilor in Paris first told me about the family I would be living with I was pleasantly surprised. Famille Chic was a well respected aristocratic family with an apartment in the desirable 16th arrondissement and a country house in Brittany. I would be living with Monsieur Chic, Madame Chic and their 23 year old son. Apparently Madame Chic liked to take in foreign exchange students because all but one of her children were grown and living elsewhere and she liked the company. Plus Famille Chic liked to learn about other cultures. On a side note, the councilor told me that I was assigned to one of the wealthiest families in the program. 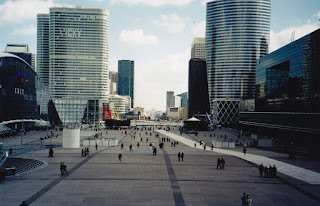 I came to learn that in France there is not an obsession with what is called new materialism. They are not a society that constantly consumes- going on shopping binges looking for the next gadget, the next upgrade, the latest thing (which probably accounts to why their homes are so enviably clutter-free). Famille Chic had absolutely no interest in ‘keeping up with the Joneses’. For example, they had one car between the three of them (and it was a very modest and nondescript car- not flashy at all). They spent their money on the things that were important to them- high quality food, excellent wine and well made clothing. I found Famille Chic’s utter rejection of new materialism so refreshing. Their restraint as consumers, admirable. To live well- to live within your means and to not be seduced by a material world. They were not bogged down by stuff and as a result lived a clean, clutter-free existence and lived very well indeed. Now that is what I call prospering. Won’t you stay tuned for #6? La Défense, the modern business district of Paris, is pictured above.